The subject matter that I find most interesting to photograph has evolved over the years. 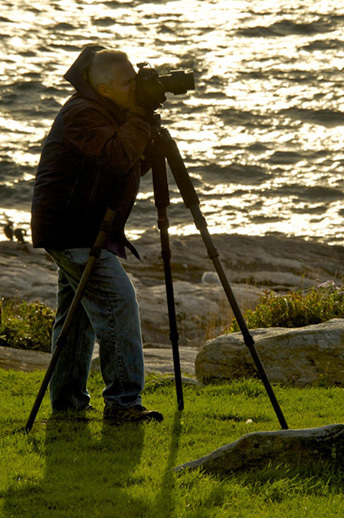 My original photographic pursuits were people and travel. As time passed I developled an interest in what I call wild nature; nature and wildlife photography. As I mature (a nice way of saying getting older) I find that my photography is taking me on adventures and to places I never thought possible. Photography has truly broadened my horizons and given me a new appreciation for our natural history. My hope, my goal is to share these scenes with others through my images and prints. I enjoy traveling and constantly update the list of places I would like to visit. I have had the pleasure of visiting many locations and observing many cultures. No matter how many trips I take, I am always amazed by the wonders of our planet. There is nothing like the feelings associated with capturing light, an expression, a gesture or color in an image. An image does not just capture a moment in time, it should tell a visual story. I started my photography at a very young age. My first camera was a Canon TX passed down to me by my father while I was in middle school. A significant influence on my photography was my high school photography teacher, Richard Bucher. He worked incredibly hard to bring out the creative fiber in me and and all his students. All too often the men and women that teach our young people are not thanked for the contributions they make to their development. In my case I have been eternally touched by Mr. Bucher's efforts. I have not always been true to my passion for photography. There was a period in time when I "put the camera down". As I reflect now on the places I have visited, I regret not having a better photographic journal of these locations. In part, that was the genesis for this website, my blog and ultimately this business. Please visit My Blog to read more about my latest adventures. You can also follow my latest post on Google+ and Facebook.